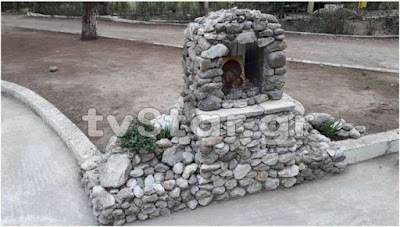 A Muslim refugee named Ahmet, who was given hospitality from Greece to stay in Thermopylae, has built a shrine to the Virgin Mary there to thank the Greek people for their help, and with tears in his eyes asks for people to pray at this shrine that the war in his homeland will come to an end. It took Ahmet one day to build it with the help of two youngsters. “We came here to escape war and we thank you for your warm hospitality, I cannot say enough about the Greek people and the way they have treated us so well. There were 25 of us who left my country on a boat and only 5 of us made it here,” he said.